In Puyo Puyo Tetris, it’s never over until the screen falls down. With both his screens piled up to the top and more grey blocks coming his way, winner’s bracket player DDR_Dan was moments away from Wumbo resetting the CEOtaku Puyo Puyo Tetris grand finals bracket on him. It was 2-2 in series, 1-1 in the game, and Wumbo had just dropped a lot of blocks, sometimes known as “garbage,” into his side of the screen. Swapping from Tetris back to Puyo Puyo though, he found an opening—a chain reaction his opponent wasn’t ready for. 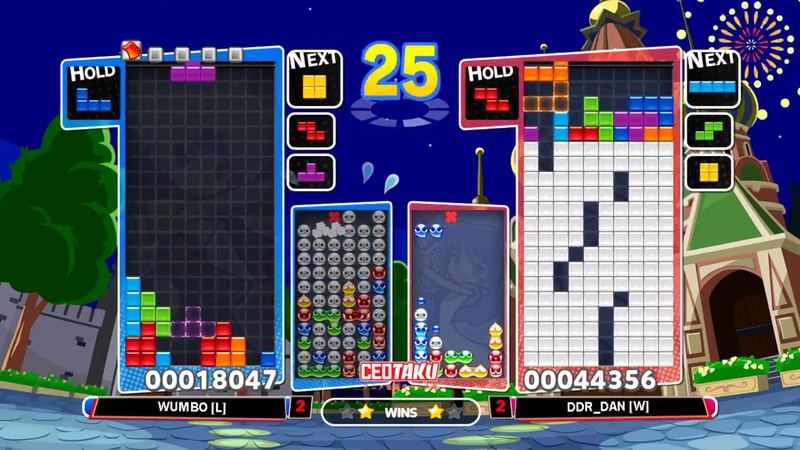 The competitive mode of Puyo Puyo Tetris utilizes both games, Puyo Puyo and Tetris. Players swap back and forth between them on a timer, shown in the middle of the screen. And while both screens were looking rough for DDR_Dan, swapping away from Tetris opened up an opportunity. A few well-placed blobs could catch his opponent, who had just sent a lot of grey blocks his way, off guard. DDR_Dan’s last-ditch effort paid off, and he walked away the victor of the tournament. To catch the rest of the anime-fueled tournament in Orlando, tune in to the CEO Gaming Twitch channel.